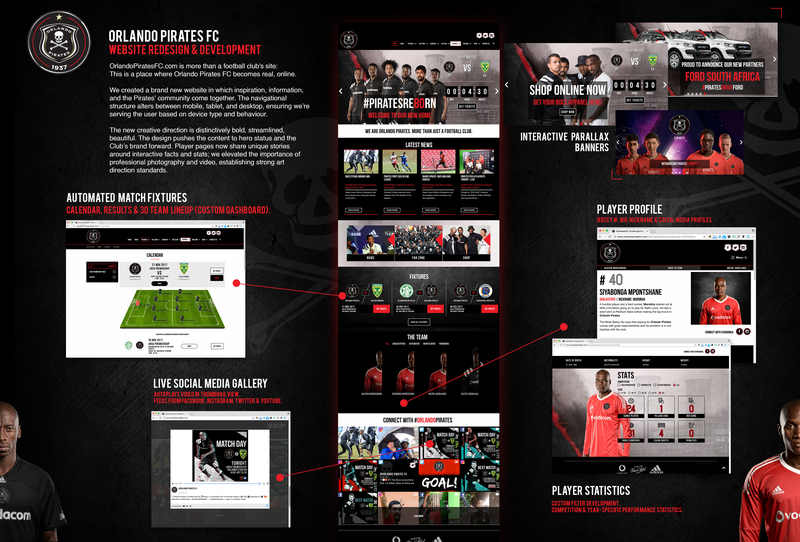 OrlandoPiratesFC.com is now more than a football club's site: It is a place where Orlando Pirates FC becomes real, online. We created a brand new website in which inspiration, information, and the Pirates' community come together. The navigational structure alters between mobile, tablet, and desktop, ensuring we’re serving the user based on device type and behaviour. The new creative direction is distinctively bold, streamlined, beautiful. The design pushes the content to hero status and the Club's brand forward. Player pages now share unique stories around interactive facts and stats; we elevated the importance of professional photography and video, establishing strong art direction standards.